MK Lightning netminder Patrick Killeen during Lightnings televised encounter with Cardiff Devils on Sunday evening. Image credit: Cardiff Devils. It was backs against the wall as Milton Keynes Lightning held on for a 4-2 Challenge Cup victory against Coventry Blaze at Planet Ice on Saturday. But they had no such good fortune the following day when they were devoured by the Devils of Cardiff 9-1 in their second Challenge Cup game of the weekend. League champions Devils raced to a 6-1 first period lead and never looked back. Man of the Match Michael Fine about to score against last season's MKL netminder Miika Wiikman. Image credit: Tony Sargent. Against Coventry the hosts grabbed two second period goals to lead 3-2 at the next break. Lightning were outshot 19-3 in the final period but somehow held on to add a fourth goal on an empty net after former MK stopper Miika Wiikman was withdrawn for the extra skater. The goal came from when Michael Fine with 9.9 seconds remaining. The success was all the more creditable for Lightning were still without Nelson Armstrong, yet to arrive in the country, Martin Mazanec, suspended, and the injured Owen Griffiths. That meant Trevor Morbeck and Cole Shudra assumed defensive duties with the result that the side was a player short of a three full forward lines against a full Coventry roster of 19 players – including impressive new signing Tim Crowder. Blaze had the upper hand to lead 2-1 at the first break – even though Lightning opened the scoring when Eric Neiley poked the puck in at 3mins 46secs. 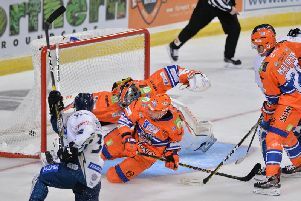 A hooking penalty on David Norris gave Blaze a sixth minute powerplay and Kevin Morris was able to redirect a blue line blast past netminder Patrick Killeen on 8mins 27secs. Coventry edged in front on 18mins 41secs when Crowder was provider for Ben Lake to score from close range. Lightning got back on terms with a goal out of nothing as Fine made it 2-2 at 28mins 30secs. Norris’ determination in front of goal produced dividends with a goal on 35mins 37secs to put Lightning 3-2 in front – it was a lead they were never to give up despite intense pressure in the third session. Both coaches called timeouts in the final four minutes but it was not until Wiikman was withdrawn and Lightning had survived a slashing penalty on Tim Wallace that they put the game to bed with man of the match Fine’s empty net strike at 59mins 50secs. 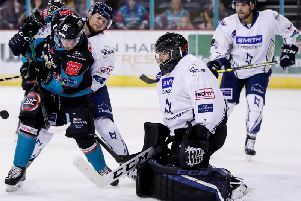 On Sunday Lightning endured a miserable night in Wales when there was no denying that they were second best against last year’s Elite League champions or that the game was over as a contest even before the buzzer sounded for the first break. By that stage Doug McKay’s charges were 6-1 behind with little chance of pulling the tie round, watched by a Freesports TV audience treated to their first taste of British Elite hockey. With just 13 skaters Lightning were always likely to struggle against a top team such as Cardiff. Even when Lightning’s absentees are back the team will still be two or three players short of a roster big enough to cope with the inevitable injuries that will occur – at least a couple more decent Brits are needed to augment the squad. The writing was on the wall as early as 1min 40secs when Devils’ new recruit Charles Linglet scored on the rebound and the home tally was doubled at 12mins 28secs as Mike Hedden was allowed to skate through to pick his spot. There was a brief moment of hope for Lightning 35 seconds later as some good work saw Norris score from Fine and Andreas Valdix’s set up. But then it was back to business for Cardiff who registered three more times before the break –Jake Morissette firing past Killeen on 14mins 4secs ahead of a Layne Ulmer strike 54 seconds after that. When Killeen was penalised for delaying the game in the 17th minute Cardiff made it 6-1 with their first powerplay marker – Joey Martin scoring the first of a straight hat-trick 36 seconds from the interval. Devils replaced first choice goalie Ben Bowns with Thomas Murdy at the start of the middle stanza and the hosts added to their tally through Martin once again on 23mins 46secs. A tripping call on Clay Anderson led to goal eight for Devils when Martin completed his trio on the powerplay at 31mins 25secs. Further misery for the visitors came on 36mins 16sec when Bentivoglio registered his first goal of the campaign to make it 9-1. Devils could afford to ease up in the final session while Lightning didn’t give up the battle they were never going to turn around an eight goal deficit due largely to defensive frailties.